Zede explains her jeans-hemming method and why it makes people gasp in excitement every time we demo it at the store! 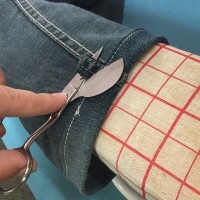 Then we get down to the dirty work of deconstructing the “save the hem” jeans hemming trend, and we we are not fans of this technique. Do you hem your jeans? What’s your favorite way? Tell us in the comments! I just started hearing your podcast and love it! You’ve given me some very useful information on my new sewing journey. I am also petite and constantly have to hem jeans, the idea of using embroidery thread and a triple stitch was a revelation!! Are you going to make a video on the little tab thing? I couldn’t properly picture it. Same here Diana!!! 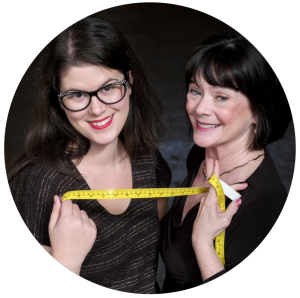 I have experienced so many “aha!” moments while listening to this podcast! I third the request for a video. I’m teaching myself to sew and it has been…interesting. You’re podcast has given me some great tips! You two are a delight! I love your “lively repartee” but even better, I always learn something!! PLEASE make a video showing your method for hemming jeans!!! No worries on the video, it truly was easy enough to figure out from your description on the podcast and the photo on your website! Great method, now I’m going to go and re-do several pair of white jeans too, it looks so polished and professional. Thanks so much! If my machine (new Bernina 350) does not have the stitch you mention, is it okay to use a regular straight stitch for my jeans hem?